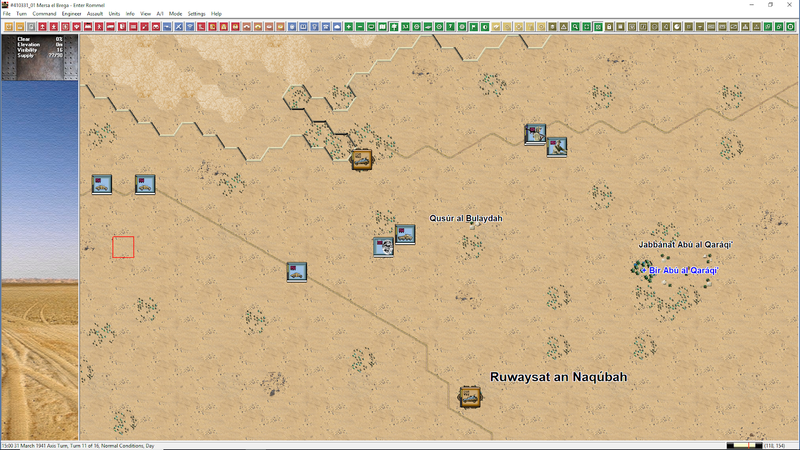 I already mentioned in that I'm fighting the Mersa el Brega scenario in the beta of Battles of North Africa. 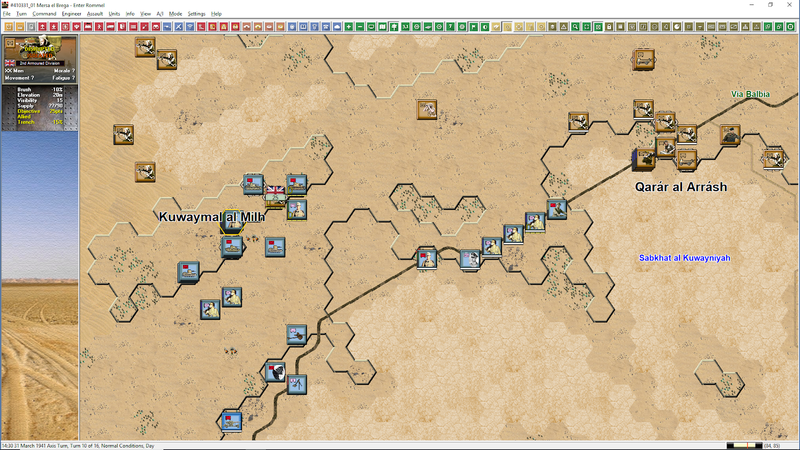 Battle is all good and dandy and then all of the sudden I realize that I'm commanding the Germans and fighting like a British! In the screenshot above, my forces (blue icons) are about to take the hill at Kuwaymal al Mill and it took me a good hour to gather and deploy my forces for the assault. 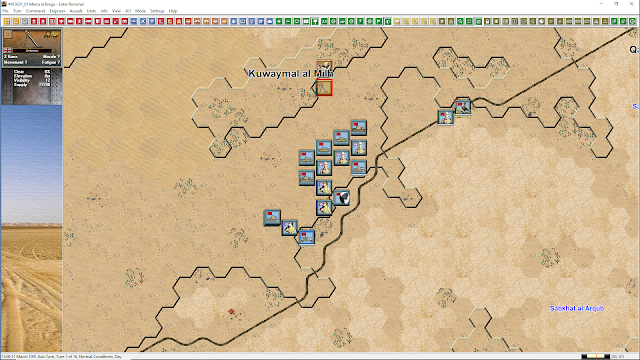 Not exactly the German way of war, with their penchant for expediency in the offensive. More like a British set-piece attack. One could argue that the hill was a though objective, but that is no excuse for my initial thought of softening ENY prepared positions with the tanks and then assaulting with the infantry. Although it may look like I was about to go on the offensive with a combined arms team of tanks and infantry (see my deployment south of Kuwaymal al Mill in figure 1), I was pretty much using my armor like a flagship shoveling shells onto an enemy ship. Yeah, that's British doctrine for the use of armored formations in the late 1930s. After 1.5 hours of sustained combat on top of the Kuwaymal hills (figure 2), losses in time, men and materiel, I learnt my lesson. But I was left in a precarious position to resume my combat operations. 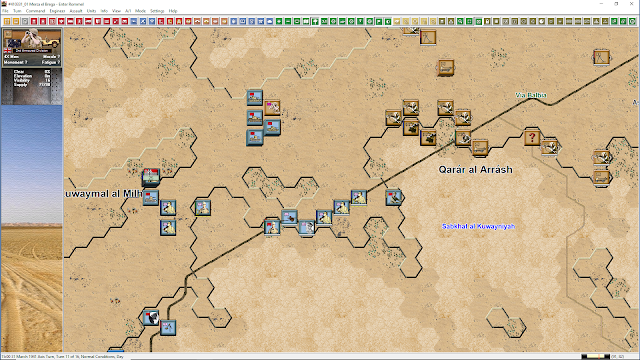 The ENY is up to something at Qarar al Arrash and in all likelihood I will need to muster all I have for the next engagement (figure 3). But wait, these were not all my sins today. On the charges of not bypassing irrelevant ENY positions: guilty as charged. Take a look at the action in the south, where the 3rd Reconnaissance Battalion has encountered one of those ubiquitous OPs dwelt by a handful of ENY armored cars (Figure 4). These ENY positions are no match for the armored cars of the 3rd Reconnaissance Battalion, but the toll is paid as time lost, unfortunately. The extraordinary mobility of the entire formation comes in handy to recover some of the time lost. In figure 5 the Battalion is shown a few kilometers west of the last engagement, but this time the intention is not to stop for those outposts where the brown icons are located. I dont see the AAR until now. Great, nothing like read the problems of a commander in battlefield to have a break from reality hehehe. Keep your pixels attacking!!! they are cheap, 0s and 1s dont suffer!! !